Going down to South Park gonna have myself a time, NetEnt has teamed up with South Park Studios for the sequel, South Park Reel Chaos Video Slot. This sequel is guaranteed to deliver loads of action along with serious chaos to loyal South park fans and newbies alike. South Parks’ famed characters have returned as fierce superheroes. 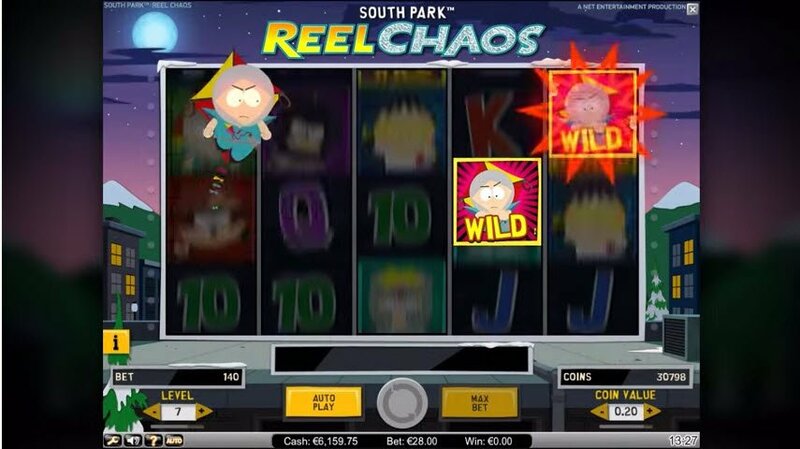 The South Park Reel Chaos slot game is a 5-reel 3-row slot that offers players 20 winning pay lines and the gamble of winning up to 650 000 coins. As one can expect, NetEnt has delivered characters and animations throughout this slot that are highly entertaining. The music adds to the drama although it can get slightly monotonous. 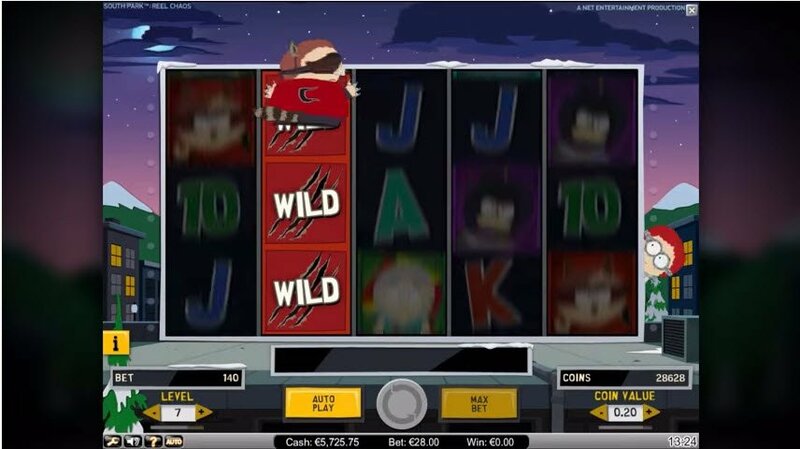 As can be anticipated in a branded video slot such as this one, the sound effects and the graphics are synonymous with the popular South Park sitcom. 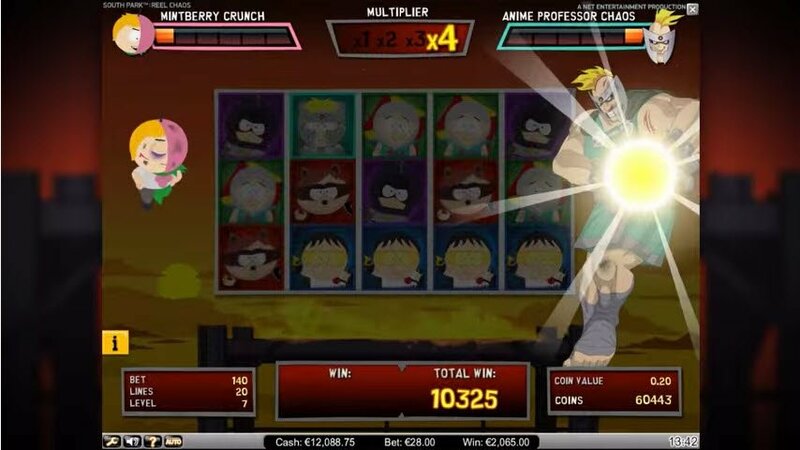 The South Park Reel Chaos slot machine provides great entertainment value, with a particularly captivating storyline. In the South Park Reel Chaos slot review, we find our idolised superheroes head to head against the evil Professor Chaos, as they protect their city from this dangerous villain. Throughout their battle players can expect to see this slot loaded with excellent features, such as stacked wilds, multipliers, multiplying re-spins, bonus spins, overlay wilds and much more. Throughout their battle players can expect to see this slot loaded with excellent features, such as stacked wilds, multipliers, multiplying re-spins, bonus spins, overlay wilds and much more. The player will find themselves in one of 4 mini games, in which each superhero will make use of their own special superpower, finally leading to the ultimate showdown, the bonus spins feature round. The enemies that they will find themselves against are; Evil Minions, General Disarray, Professor Chaos (who sits on his throne of Chaos) and finally Anime Professor Chaos. Defeating all four of the above mentioned rivals will result in players receiving South Park Reel Chaos Slot bonuses fit for a champion. In the round where Cartman is up against General Disarray, Cartman works hard to get his grip on General Disarray by creating stacked wilds as he makes his way up and down the reels.We see Kenny battle it out against Professor Chaos, and as a result the player can be awarded a multiplier of up to x5. Kyle creates 3-5 overlay wilds as he goes head to head against Evil Minions. Stan randomly triggers a multiplying re-spin, causing a re-spin across all the reels.